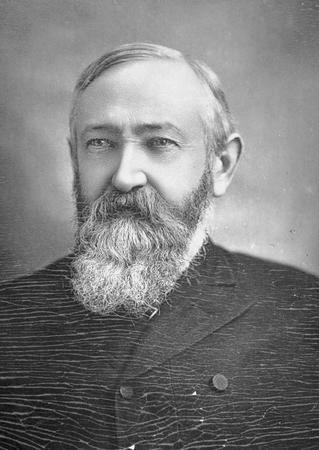 Portrait of Benjamin Harrison who served as President from 1889-1893. Harrison was from North Bend, Hamilton County, Ohio and the grandson of William Henry Harrison. Benjamin Harrison was born on August 20, 1833, in North Bend, Ohio. His great-grandfather was John Cleves Symmes, and his grandfather was President William Henry Harrison. Benjamin Harrison attended Farmers' College in Cincinnati, Ohio, before transferring to Miami University in Oxford, Ohio. He graduated from Miami University in 1852 and studied law with an attorney in Cincinnati. In 1853, Harrison married Caroline Lavinia Scott Harrison. The next year, the couple moved to Indianapolis, Indiana, where Benjamin established a legal practice. He soon gained the respect of his fellow attorneys. At the beginning of the American Civil War, Harrison enlisted in the Union Army. He served throughout the war and reached the rank of brigadier-general of volunteers. After the war, Harrison was the reporter of the Indiana Supreme Court from 1865 to 1868. Harrison ran for Governor of Indiana in 1876 as a member of the Republican Party. He lost this election, but he emerged as one of the state's most powerful Republicans. In 1880, the Republican Party considered nominating Harrison as its candidate for the presidency of the United States, but Harrison declined. The nomination went to James Garfield, an Ohioan. Garfield offered Harrison a cabinet office upon winning the presidency, but once again, the Indianan refused. In 1881, the Indiana legislature appointed Harrison to the United States Senate. In 1888, the Republican Party nominated Harrison as its candidate for President of the United States. Harrison accepted the nomination. Although he lost the popular vote to the incumbent, Grover Cleveland, Harrison won the Electoral College vote and the presidency. The corruption seen in the 1888 elections prompted the federal and state governments to reform the election process. Among the changes was the introduction of the "Australian" or secret ballot. As president, Harrison took thousands of acres of land from American Indians. He also participated in the admission of several states to the Union including North Dakota, South Dakota, Montana, Washington, Wyoming and Idaho. The Republican Party re-nominated Harrison for the presidency in 1892. He lost the popular and Electoral College vote to Grover Cleveland, the man he had defeated four years earlier. The principal reason for Harrison's defeat was growing uncertainty with the economy that later resulted in the Panic of 1893. Upon completing his term in March 1893, Harrison retired to Indiana, where he continued to practice law. Harrison died on March 13, 1901. Harrison, Benjamin. Public Papers and Addresses of Benjamin Harrison, Twenty-third President of the United States: March 4, 1889, to March 4, 1893. New York, NY: Kraus Reprint Co., 1969. Sievers, Harry Joseph. Benjamin Harrison. New York, NY: University Publishers, Inc., 1960. Socolofsky, Homer Edward, and Allan B. Spetter. The Presidency of Benjamin Harrison. Lawrence: University Press of Kansas, 1987.